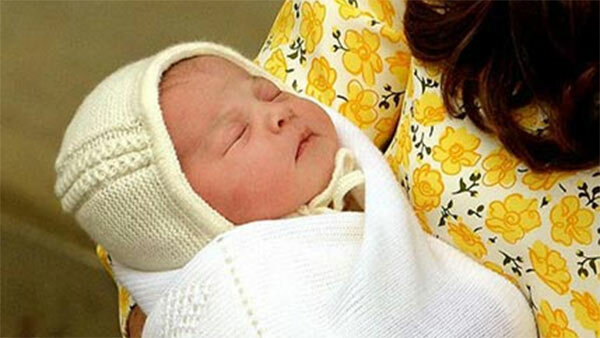 Britain's littlest princess has made her debut. Prince William and Kate Middleton stepped outside the Lindo Wing with their baby girl this evening, the same day the Duchess of Cambridge gave birth. The baby, whose name has not yet been released, was wrapped in a white blanket in the Duchess of Cambridge's arms. Kate, not even one-day post-partum, was glowing in a yellow and white dress by Jenny Packham. The couple were smiling ear to ear as they waved to the crowds, but neither William nor Kate made any comments. After a few moments, they went back inside. A few minutes later they came back out and headed straight to a car, and William put the baby in a car seat in the back. William got in the driver's seat and the crowd cheered as they drove away. Prince William brought Prince George by the Lindo Wing to visit earlier today, but George had already returned home by the time his parents and new sister made their much-anticipated debut. When William left to pick up George, he told the crowd outside that he and Kate were "very happy." William, Kate and the baby are leaving the hospital this evening to go to Kensington Palace. The Duke and Duchess of Cambridge welcomed a baby girl at 8:34 a.m. local time, Kensington Palace said today. She weighed in at 8 pounds and 3 ounces and was said to be doing well. The baby was born in the Lindo Wing of St. Mary's Hospital, the same place where Kate, 33, gave birth to the couple's first child, Prince George, in July 2013. Last September, royal officials said George's younger sibling was on the way. Throughout her pregnancy, Kate, who suffered from hyperemesis gravidarum, as she did before having her first child, attended a number of royal engagements, including her first trip to New York City back in December. However, the Duchess had plenty to do at home, too: She and William, who is now working full-time as an ambulance pilot, tried to prepare their 10-bedroom mansion, Amner Hall, for the new addition. "(Kate is) very hands-on when it comes to decorating," said Victoria Murphy, ABC News' royal contributor. "We've heard about her out and about shopping, going to shops, buying things herself." While William will return to work soon enough, Kate will likely take a few months off to spend time with the children. However, royal watchers shouldn't expect to catch a glimpse of them in London. Instead, the family is expected to spend a good deal of time at Amner Hall, located on the queen's estate in Norfolk, England, while the children are young. "It's a kind of completely enclosed childhood ... and I think that's what William and Kate, particularly William, wants for his children," said royal contributor Roya Nikkhah. "He wants to have that incredibly normal life that's completely private, that's away from the spotlight." The newborn is fourth in line to the British throne after her grandfather, Prince Charles, father, Prince William, and brother, Prince George. The reigning monarch, Queen Elizabeth II, ascended to the throne in 1952. The baby is the queen's fifth great-grandchild.